Buttery Cinnamon Spread (make ahead if possible). Combine in a stand mixer or by hand and beat until light and fluffy. Set aside at room temperature. Prepare this ahead of time and store in cooler until needed. Remove from the fridge the night before so that the Buttery Cinnamon Spread is softer and easier to spread. Combine dry ingredients in a stand mixer or a large mixing bowl if doing this by hand. Add cold butter and cut into flour with the paddle attachment. (by hand cut in with pastry blender or 2 knives). Mix until mealy, until the butter is pea size. 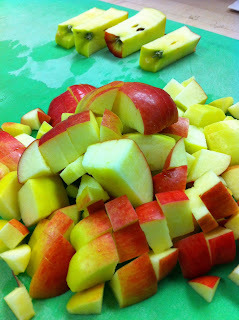 Add warm water and beat on low speed until the dry ingredients are mixed in about 1 minute. Remove from bowl and place on floured board or counter. Cut dough in half to work with one half of the dough at a time. Spread a thin layer (approx. 1 cup) of Buttery Cinnamon Spread onto dough making sure all surfaces are covered including the corners. Roll dough up into a log roll. Cut into 6 equal pieces (or 8 if smaller pieces are needed) with a metal scraper or a knife. 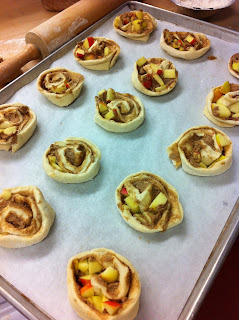 Place onto a parchment lined baking tray. 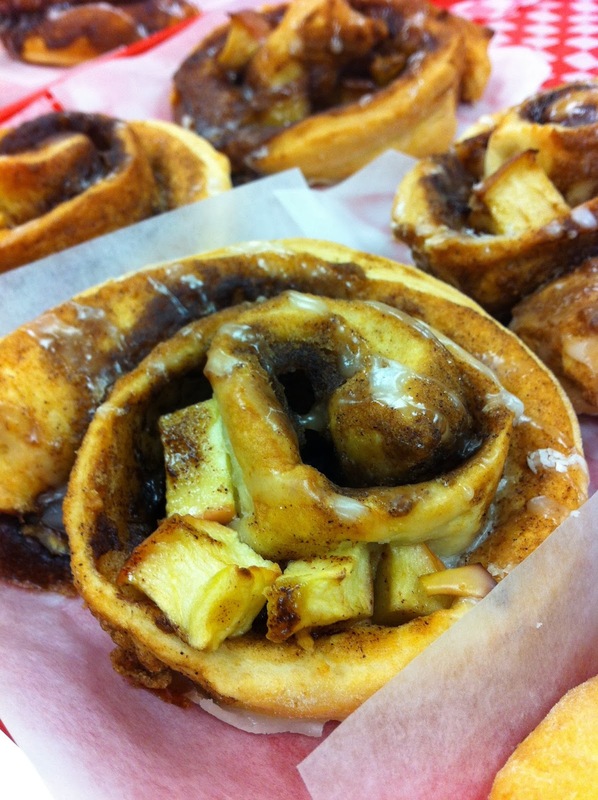 With your clean fingers, open up the top of each of the Apple Cinnamon Swirls so that each swirl looks the same. Continue on with the second half of the dough using the same procedure. Bake for 15 minutes @ 375° or until lightly golden brown. Remove from oven when golden brown and immediately drizzle with glaze (see below). Put above in a small bowl and stir until smooth. Set aside to glaze hot cinnamon biscuits.